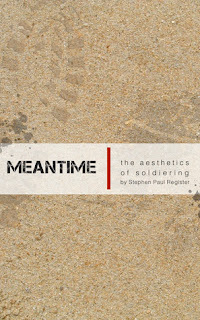 Several months ago, I interviewed Stephen Paul Register about his memoir, MEANTIME: The Aesthetics of Soldiering, and invited him to do a guest post about the sudden surge in popularity of dystopian and post-apocalyptic literature and how he felt about it personally. Since he's spent time in situations and areas that many of us would see as dystopian, I was very interested in reading his thoughts on the matter. Since some of the books he mentions in the post are controversial, I thought this would fit well with Banned Books Week. I hope you enjoy his guest post as much as I did. What is the obsession with dystopias these days? The Hunger Games has become a hands-down dominator in the market recently (LeBron is even reading them), Nashville has recently invited Margaret Atwood to do a citywide speak on The Handmaid’s Tale (Nashville high schools have controversially made The Handmaid’s Tale a mandatory read for students this year—and The Handmaid’s Tale is not even Atwood’s most recent dystopian novel! Oryx and Crake and The Year of the Flood are much later dystopian releases), and the films Dredd and Total Recall are rereleases of dystopian films released within the past twenty years. (Questions of these films’ quality remain). I honestly do not know what is so fashionable about dystopian films. This post is not going to be an exploration of the emotional ups and downs or philosophical perspectives that the rich genre of dystopian fiction provides readers or viewers. What I am going to do is tell you a little bit of my own experience to help provide an alternate perspective on dystopias — a dystopian perspective from the other side of the tracks. In 2003 I was deployed with the Tennessee National Guard to serve in the early stages of Operation Iraqi Freedom. Though a warzone is no futuristic world where everything has gone 1984 or Brave New World topsy-turvy, it is a very present world where things exist in an upside down way, a way that is, on many levels, opposite to the way we experience life in the modern West. Things I took for granted growing up as a child in the U.S. are impossible to take for granted anymore in a warzone. As a child I was taught to “turn the other cheek” and that “the bigger man walks away from a fight.” However, in a theater of war, the losers of the battle “turn the other cheek” and the “bigger men” are the troops that dominate the enemy through excessive violence and the outworking of violent strategies. In Baghdad there were people that wanted me dead, that shot mortars and rockets and me and my fellow troops and tried to kill us. That is not how it is in America, at least not for me. In a warzone, many, many basic assumptions of civilization are thrown to the wind. Soldiers have very little quality of life comfort, they sleep little, are subject to extreme weather conditions, and violence is rampant. That seems pretty dystopian to me. While I was in Iraq I fell in love with reading. I loved reading 18th and 19th century fiction most of all. It was while I was in a warzone that I first read Anna Karenina (http://www.youtube.com/watch?v=rPGLRO3fZnQ). There is this one scene in the book that I loved: the character Levin decides he wants to go out to the fields and cut hay with his peasants; Tolstoy describes the scythe and the way it cuts through the luscious grass, he describes the hayfield and the way the light hit it through the trees, and he described the pure and simple relief that a drink of water can give you while working a field. This pure and simple and beautiful country life was such a joy and a relief to read about while I was in the desert, in a theater of war. This Tolstoyan scene was opposite of war. It was the opposite of my dystopia. That book and books like it helped me escape the dystopian warzone around me. Maybe a similar sort of thing is happening with readers and viewers of dystopias in the U.S. today. Maybe we like reading dystopias because things are so amazing here in this peaceful civilian world. Sure, we have our economic problems, we have our headaches, we have the political parties that we can’t stand, and, sure, healthcare is getting trickier and trickier. But nobody shoots at us on a daily basis. Nobody really wants to blow us up. Supermarkets still have food. Most of us have air conditioners or heaters when we need them. Electricity usually stays on. Maybe we read dystopias because, deep down, we know how good we’ve got it. And dystopias help to show us that. They show us how good we’ve got it by showing us how bad things can actually get. You can find Stephen on his Website, Facebook, Twitter, and Goodreads! 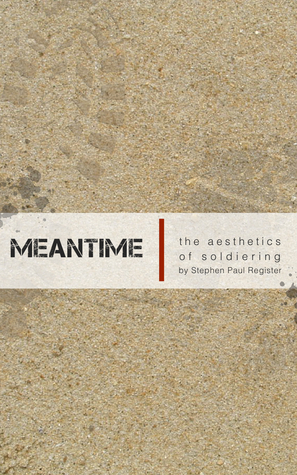 Be sure to put MEANTIME on your TBR pile on Goodreads!